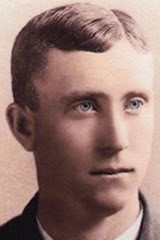 Ledell "Cannonball" Titcomb had a name made for 19th Century baseball. He was born on August 21st 1866 in West Baldwin, Massachusetts. At five foot six inches, he is remembered as one of the shortest pitchers in baseball history. The left hander made it to the Philadelphia ball club in 1886 & 1887. Later that year he was sent to the New York Giants, pitching in the early days of the first Polo Grounds. At that time the Polo Grounds was located at 110th St. near 5th Avenue. Cannonball was the Giants opening day starter that year, as the went on to win first place as well as the leagues Championship. He went 14-8 with a 2.24 ERA on a staff that featured 35 game winner; Tim Keefe & 26 game winner; Mickey Welch. In 1888 he was second in the league in strike outs, behind team mate Keefe and it is believed this is how he got the nickname of Cannonball. Another team mate; Ed Crane was also referred to as Cannonball & they became known as "the Cannon ball Duo". Cannonball was a common nickname of the time, but only Titcomb is remembered for having it known as his first name. 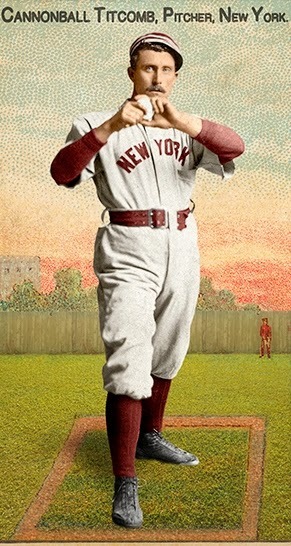 He pitched one more season with the Giants, before going to the Rochester Broncos & throwing a no hitter in 1890. In a five year career he is 30-29 with 283 strike outs & a 3.47 ERA in 63 games (61 of them complete games).